Mămăligă (Russian: Мамалыга) is a dish made out of yellow maize traditional for Romania, Moldova and Ukraine. 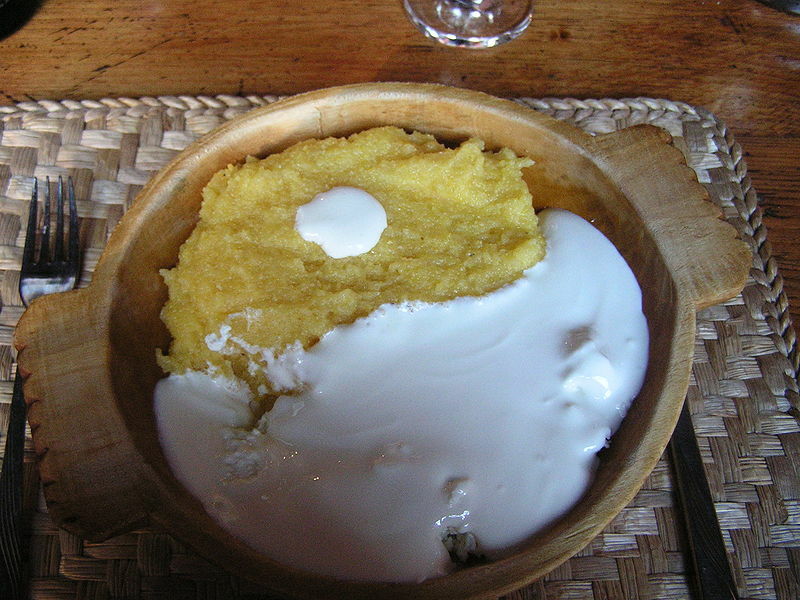 It is better known to the rest of the world in its Italian form - polenta. Left: Mămăligă served with a type of feta cheese and sour cream. Historically a peasant food, it was often used as a substitute for bread or even as a staple food in the poor rural areas. However, in the last decades it has emerged as an upscale dish available in the finest restaurants. Traditionally, mămăliga is cooked by boiling water, salt and cornmeal in a special-shaped cast iron pot. 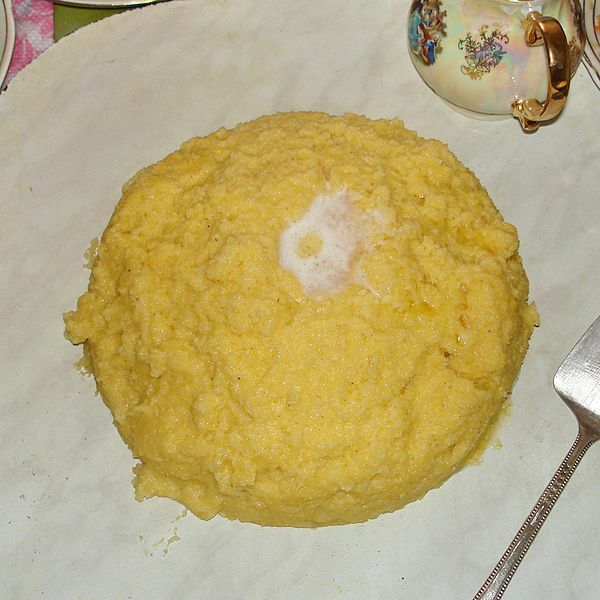 When cooked peasant-style and used as a bread substitute, mămăliga is supposed to be much thicker than the regular Italian polenta to the point that it can be cut in slices, like bread. When cooked for other purposes, mămăliga can be much softer, sometimes almost to the consistency of porridge. Because mămăliga sticks to metal surfaces, it can be cut with a string into slices, and is eaten by holding it with the hand, just like bread would be. Mămăliga is often served with sour cream and cheese on the side or crushed in a bowl of hot milk. 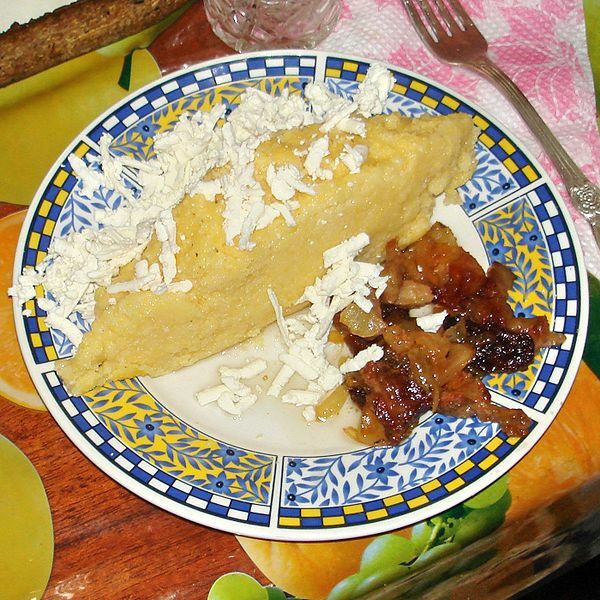 Sometimes slices of mămăligă are pan-fried in oil or in lard, the result being a sort of corn pone (cornbread). Since mămăliga can be used as an alternate for bread in many Romanian and Moldovan dishes, there are quite a few which are either based on mămăligă, or include it as an ingredient or side dish. Arguably, the most popular of them is sarmale (a type of cabbage rolls) with mămăligă. Left: Mămăligă served with a type of feta cheese and pork scratchings. Mămăligă is a versatile food: various recipes of mămăligă-based dishes may include milk, butter, various types of cheese, eggs, sausages (usually fried, grilled or oven-roasted), bacon, mushrooms, ham, fish etc. Mămăliga is a fat-free, cholesterol-free, high-fiber food. It can be used as a healthy alternative to more refined carbohydrates such as white bread, pasta or hulled rice.